The slow-cooker is a helpful tool for busy families. It helps create a hot, home-cooked meal when you come in from carpooling or the office. 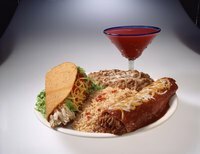 This recipe creates a shredded chicken taco recipe that is simple to put together, tasty and filling. After the chicken is cooked, it takes less than 20 minutes to move from crock pot to the plate. Spray the crock pot with a non-stick spray or use a slow cooker liner to make cleanup easy. Rinse the chicken breasts and pat dry. Layer the uncooked boneless, skinless chicken breasts over the salsa. Cover the chicken with the remaining salsa. Cover the crock pot and cook on low for six to eight hours. Use two forks pull apart the chicken breasts after they have cooked in the crock pot. Let the shredded chicken cook another 15 minutes on low in the crock while you prepare your taco shells or tortillas and side dishes. Spoon the chicken into the shells or tortillas and top with your favorite guacamole, cheese, olives, sour cream and cilantro. If you need to be away from the crock more than eight hours, use frozen uncooked chicken breasts instead and cook on Low for 10 to 12 hours. Pulled chicken is SO easy and delicious! Just about 10 minutes and it's ready. Step by step with photos.